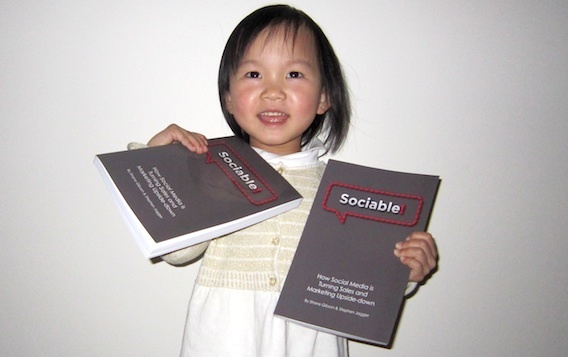 Sally Chow with her copies of Sociable! Sociable! is a new book by local Vancouver bad boys, Shane Gibson and Stephen Jagger. According to Shane and Stephen, it’s not who you know but who knows you in today’s hyper-connected marketplace. Understanding the rate social media and social networking play in this new dynamic, is paramount to our success as professionals in our field. Sociable! shows how to make social media work for you. Sociable! is available right now at Amazon.com for $25. You can download chapter 1 to get a preview or if you’re lazy and don’t like reading, you can listen to the MP3 audio version. I am in the book but not on Chapter 1, so you’ll have to buy it to find out what I had to say. Come out this Thursday and party with Shane and Stephen and other social media users at the Sociable! launch party at V Lounge in Yaletown. Copies of Sociable! will be available for purchase and Stephen Jagger and Shane Gibson would be pleased to sign them for you. Anyone planning on purchasing a book, please bring cash or a cheque as there’s no credit card processing capabilities on site. Shane gave me ten signed copies of Sociable! to give away as I see fit. I figure I’ll start by giving two to two commentators. Reply to this post and you’re entered. Your odds of winning depends on how many people reply. I’ll draw the winners next week. If you want some better odds, then join me for Dot Com Pho tomorrow. I’ll give two copies of Sociable! to two random attendees. Follow me on Twitter to find out the time and place of the meet up.